All the Ladies in the House Say "Landscape!" Most artists are forgotten after their death, but women artists are forgotten more easily. (Perhaps because most art historians are male?) This is particularly true of the Hudson River School of painting, the first native American art movement. “Remember the Ladies: Women of the Hudson River School,” the first-ever exhibition of female artists of this crowd, will come to the Thomas Cole National Historic Site in Catskill on May 2. Women of the 19th century had to surmount numerous obstacles to become serious painters. To begin with, females were excluded from life-drawing classes, to shield their dainty eyes from the truths of human anatomy. Besides, the elaborate trappings of Victorian dress made outdoor excursions difficult. (Typically, Hudson River School artists scaled mountains and hiked nature paths to remote landscapes. 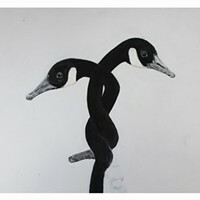 They would make oil sketches or drawings there, then return to the studio to produce finished paintings.) “Remember the Ladies” emphasizes the achievements of women fighting the limitations of their culture. “They saw certain opportunities, and they homed in on them. So it’s very much a story of success,” observes Jennifer Krieger, co-curator of the show. 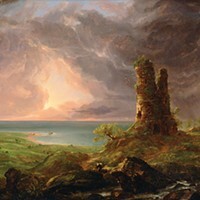 Krieger is managing partner of Hawthorne Fine Art, a Manhattan gallery that specializes in Hudson River School painting. She first fell in love with this style of art while an undergraduate at Vassar College. The 25 works in the exhibition cover the entire duration of the Hudson River School, from 1825 to 1884. Canvases of this movement vary greatly in scale, from petite to movie screen size. “Remember the Ladies” is no different. One anomaly is a pair of Julie Hart Beers paintings on composition board shaped exactly like china plates. The two views, of the Hudson and of a woodland stream, combine precise painting with the female tradition of decorating china. Two other canvases are of exotic locales: Josephine Ellis’s image of Natural Bridge in Virginia, and Elizabeth Gilbert Jerome’s “Tropical Landscape,” based on a visit to South America. After all, the Hudson River School was not a physical place so much as a way of seeing—a sensitivity to the reflective surface of a pond, the gesture of a leaning elm. Human figures are few, and usually dwarfed by trees or hills. Admission is free from noon until 1:30 p.m. on May 2. Jennifer Krieger and co-curator Nancy Siegel will give lectures at 2pm. “Remember the Ladies: Women of the Hudson River School” will be on view at the Thomas Cole National Historic Site in Catskill from May 2 through October 31. (518) 943-7465; www.thomascole.org. 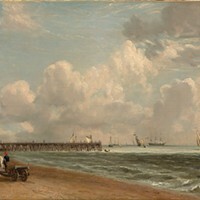 MARY BLOOD MELLEN, FIELD BEACH, OIL ON CANVAS ON BOARD, 24" x 33 15/16", CIRCA 1850. COURTESY OF CAPE ANN MUSEUM. GIFT OF JEAN STANLEY DIES.